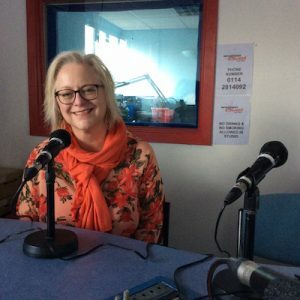 The Business Live radio show is back and in the first programme of the year I managed to get the date right. Phew. The podcast of the 12 January 2019 show is below. This week’s guest was Lisa Walker who runs White Apple Thinking, helping professional people to become more motivated and focused, clarify what they want, and improve results in their working and out-of-work lives. Lisa’s been in business for 6 years after a background in HR (until she decided she didn’t want to work for anyone else). Her first 18 months of self-employment involved “staring at a computer waiting for people to find me” as an HR consultant. She works with professionals such as finance directors, accountants, and other technically-minded folk. Many are outwardly highly successful but their fears, self-beliefs, inner conflicts, lack of confidence or “imposter syndrome” might be leading to self-sabotaging behaviour. “If you can help people to accept and understand accept the benefits of changing, transformation can happen” says Lisa. And in the podcast she talks about how she does this. What is imposter syndrome? How does Lisa help clients deal with it? We don’t like to brag in the UK, but we do need to celebrate success – and shine! But what if you’re conscientious and really care about doing a great job? When we see people get to leadership roles in business and politics based on bluster and overconfidence with no substance behind it, does this mean we should copy this behaviour? When Lisa’s passion, purpose and skills aligned, how did she build her business to do the work she loves doing? The personal development industry contains many folk with integrity and a great evidence base for the work they do – but others peddling hope and optimism or taking money without delivering results. How did Lisa find coaches she could trust when she wanted support? Lisa generates meaningful results herself, but what does she do when the “little gremlin of self-doubt” whispers in her ear? A coach will help you, guide you and support you but they can’t do the work for you. An early experience which made this clear. 51:09 getting in touch and wrapping up. Check out Lisa Walker’s website, White Apple Thinking, here.